The Sun King ECO by Greenlight Planet is perfect for backpacking and long distance trekking as it's lightweight and designed to survive harsh climates all over the world. It redefines affordability and longevity as it is built to survive harsh climates and is virtually indestructible outside or indoors. Detachable solar panel with a repairable junction box and a five-meter cable. Aluminum-framed, industrial-grade glass protected solar panel means superior durability. 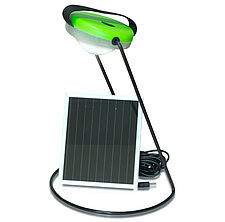 The Sun King Eco is an ideal home, camping or travel accessory.